We are offering our clients with the best Weighing Scales. This range includes Precision Weighing Scales, Desktop Weighing Scales, Weighing Scales and crane Scales. This range is manufactured using qualitative basic material and latest technology. Owing to their construction, these scales hold attributes such as longer functional life, robust construction and accurate measurements. We are offering our clients outstanding Test Weights. These products are precisely manufactured by our professionals who hold expertise and years of experience in this discipline. Furthermore, they design these products while keeping in mind evolving demands of the clients and industry laid parameters. 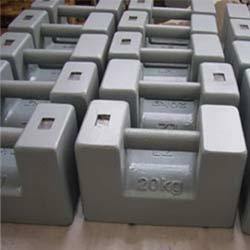 To cater to the divergent demands of the clients, we offer these weights in different weights (50 g to 1 ton ) and sizes. We are looking for export queries only.